If you demand performance from your printer, you will not be disappointed with the HP 4250tn. 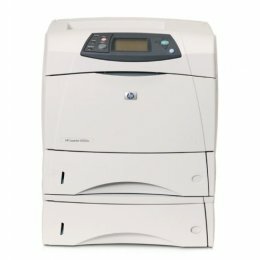 This ultra dependable printer delivers 1200 x 1200 dpi prints at speeds of up to 45 ppm. Complex print jobs are no problem with the 460 MHz processor and 64 MB of RAM. The printer has an extra tray to help with productivity and it is also network ready. If you need a steady and strong performer in your office, get the HP 4250tn. Features Print Speed: Up to 45 ppm Black, First page out in 8 seconds Resolution: Up to 1200 x 1200 dpi Paper Handling: 1,100 Sheet Input Capacity Consists of: 1 x 100 Sheet Multipurpose Tray 2 x 500 Sheet Input Tray Memory: 64 MB (512 MB Max.) Connectivity: USB, Parallel, and 10/100 Base-TX Ethernet Environment: Mac and PC Compatible Warranty: 1 Year Exchange covering parts and labor. Dimensions (H X W X D) 19.6" x 16.5" x 17.8"
Allow ink to dry completely to avoid smudging. The time will vary based on the ink and paper quality used as well as the temperature and humidity conditions.